Hi, Good Morning. Thank you, friends and viewers. 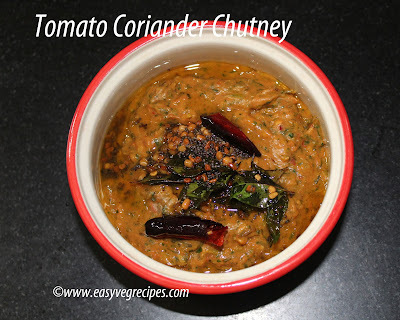 Today I will post how to make tomato green chilies chutney recipe. The best part of this chutney is it can be served with both rice and dosa, idli. I love to use tomatoes as many as possible. Given a chance, I wish to have them raw also. We can make a variety of dishes with tomatoes. Tomato pickle, tomato rice, dal with tomato and tomato ketchup, kids fav, the list goes on.. I picked this recipe from my bhabhi, brother's wife, Sailaja. I am presenting a small 2-minute video for easy reference and clear understanding of the recipe. Please do watch and post your comments. You can subscribe to my channel for regular updates. Cut tomatoes, green chillies and chop coriander leaves. Heat oil in a kadai, add green chillies, red chillies, coriander and tomatoes also. Add salt, turmeric powder and asafoetida. Saute well. Cook them till the tomatoes become mushy. Once the tomatoes turn mushy, spread this on to a wide plate to cool. Meanwhile, prepare tadka. Heat oil in another kadai, add mustard seeds, black gram, fenugreek seeds, red chilli and curry leaves. Let this tadka splutter and keep it aside. Separate chillies from the tomato chilli mix. Put them in a blender jar. Blend them to make a coarse paste. Add tomatoes and blend it to make chutney. Check salt, add if necessary. Add the above prepared tadka to the chutney. Enjoy!! spicy, tasty tomato green chilli chutney with rice or dosa. For more chutneys click here.Thank you for visiting my blog. Hope you liked all my recipes. Any feedback and comments are appreciated. Seems interesting. I will try this shortly and post the results.